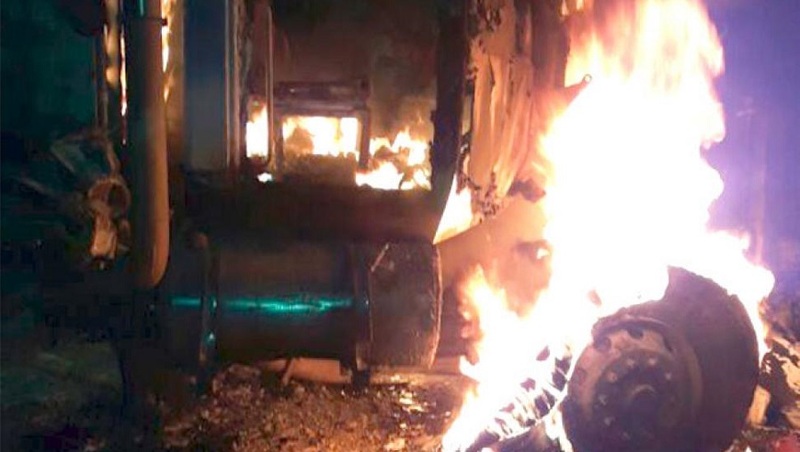 Two trucks carrying wood were set on fire Monday in the midst of protests taking place around the Colombian towns of Segovia and Remedios, located in the northern Antioquia department. For the past 25 days, some 10,000 artisanal and ancestral miners operating in the area have been on strike and rallying against expansion plans by Zandor Capital, a subsidiary of Canadian-based Gran Colombia Gold, and also in opposition to Bill 169 which, they say, would eradicate artisanal mining. Even though protesters didn’t take responsibility for torching the trucks and, according to Noticias Caracol, the people accused of doing it were able to escape, the incident took place in an area adjacent to where the demonstrations are happening. In response to the recent developments in Segovia and Remedios, Mining Vice Minister Carlos Andrés Cante asked the small-scale miners to negotiate their position. “We have been open to a dialogue but we are not going to move forward if the strike and blockades continue. We have asked the leaders of the mining table to come and talk to the provincial government in Medellín, but they don’t seem willing to do so,” he told RCN Radio. Cante reminded the protesters that there are 34 Mining Production Units formalized in Segovia, which employ 2,500 people and help eradicate illegal activities.